Back in August we bought you word that Valve Software (the company behind classic games like Half-Life and Portal) had revealed plans to expand the scope of its online video game distribution service Steam to include “creativity and productivity” software. At the time the company planned to add this new line of programs to Steam on September 5, but due to unforeseen delays, that date came and went without any huge alterations to the Steam lineup. 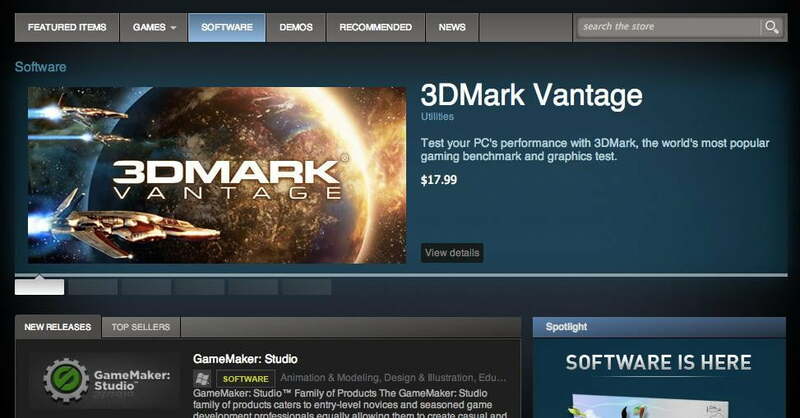 Today however, Valve made good on its promise, and if you were to visit Steam right now you’d find such titles as PC benchmarking software 3DMark Vantage and Gamemaker: Studio, a program that aids people in creating casual games. While we’re always big fans of novelty, the real good news here is twofold: First, to celebrate the creation of Steam’s “Software” section, Valve is offering all of its “creativity and productivity” items at a 10-percent discount “throughout the week.” Second, the Steam iterations of these software packages feature a level of integration with Valve’s online service previously only seen in popular games. “Many of the launch titles will take advantage of popular Steamworks features, such as easy installation, automatic updating, and the ability to save your work to your personal Steam Cloud space so your files may travel with you,” reads the official press release issued by Valve to complement this otherwise stealthy launch. Still, this move leaves a number of questions in its wake. Most crucially, why would Valve Software, a company that has found massive success in the gaming sphere, opt to expand its operations into a wholly new section of software that has been almost entirely dominated by megacorporations like Microsoft and Adobe for the majority of the past three decades? Hoping to shed some light on the situation, we posed that query to Doug Lombardi, Valve’s director of marketing. “Also, with Steam Greenlight, we hope to one day see new types of non-gaming and/or game creation software emerging from Steam,” he added. To be perfectly candid we expected the response to be something along the lines of “there’s money to be made,” but Lombardi’s reply is a bit more thoughtful than that. Or, if you’re entirely too cynical, it might be described as “calculating.” By offering up these software programs — almost all of which, it should be said, can be directly employed in the creation of video games — Valve is not only pulling in profit while appeasing fans, it’s also making it that much easier for the next big game idea to emerge from the mind of the average gamer. Maybe you have a brilliant idea for a video game, but completely lack the tools to create such a thing; Now Valve’s Steam service is a one-stop software shop for your development needs, and once your phenomenal, world-beating game is complete Valve will be more than happy to add it to the Steam marketplace. That’s undeniably clever.